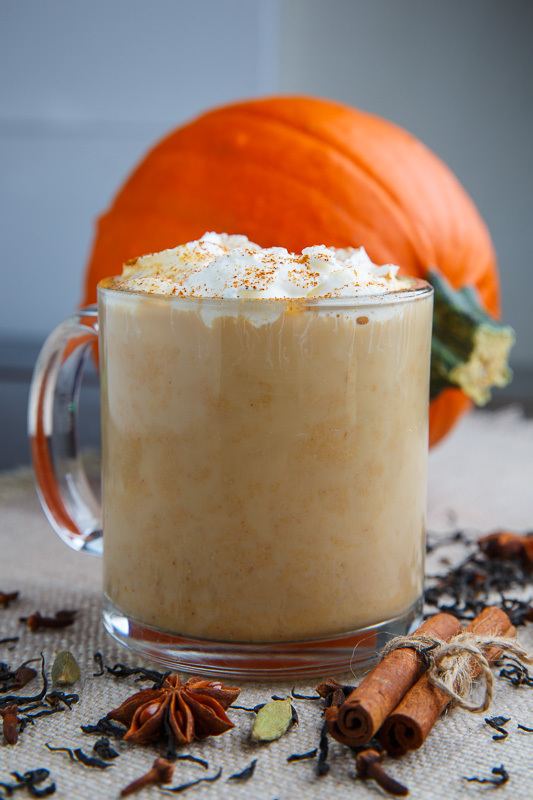 An aromatic, smooth and creamy pumpkin chai latte with actual pumpkin in it! With the holidays quickly approaching there are going to be a lot of busy days and it’s nice to take a break every once in a while and enjoy a decadent drink. 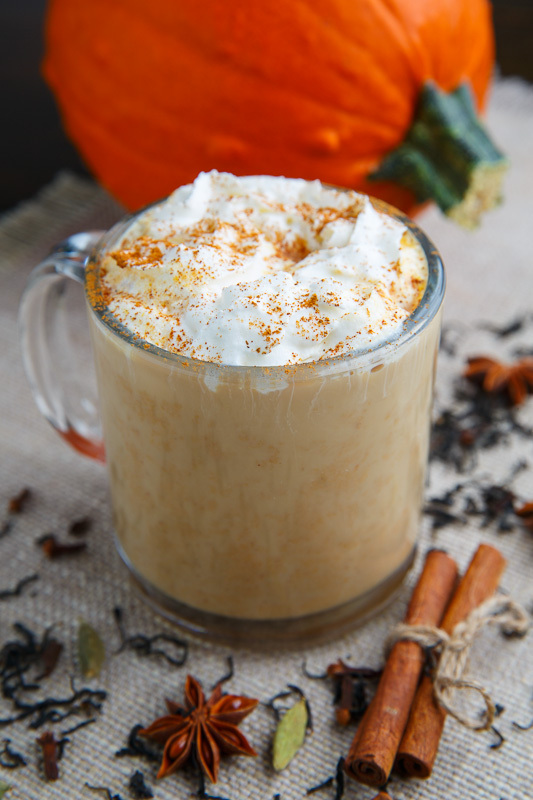 Pumpkin spiced latte is a good option that is easy to make at home and its also really good with tea rather than coffee! When I think about a pumpkin and spice tea I can’t help but think about chai tea which is a black tea that has a few aromatic and warm warm spices mixed in. 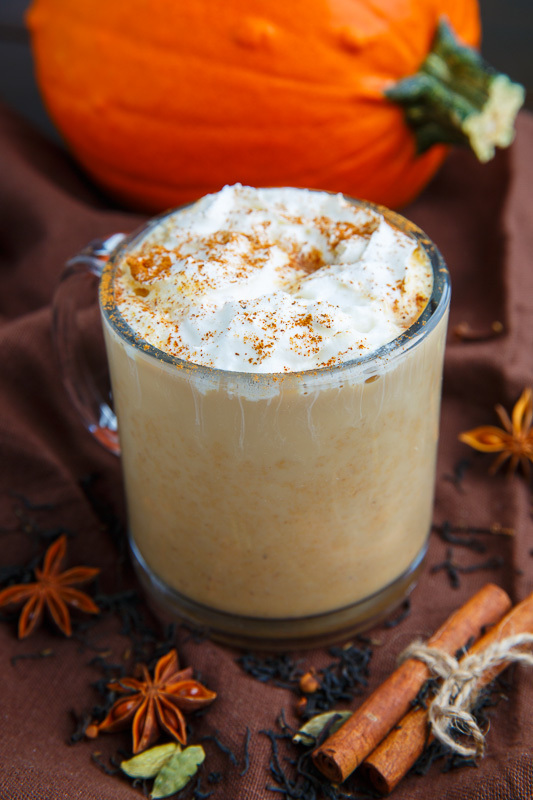 The spices used in chai tea vary and for this pumpkin chai latte I like to go with some pumpkin inspired spices including cinnamon, cloves, nutmeg and ginger, along with more typical chai spices like cardamom and star anise. Of course you could keep things simple and just use bags of your favourite chai tea! Once you have the strong brewed chai tea you simply add it to some milk along with plenty of pumpkin puree and sweeten as desired. 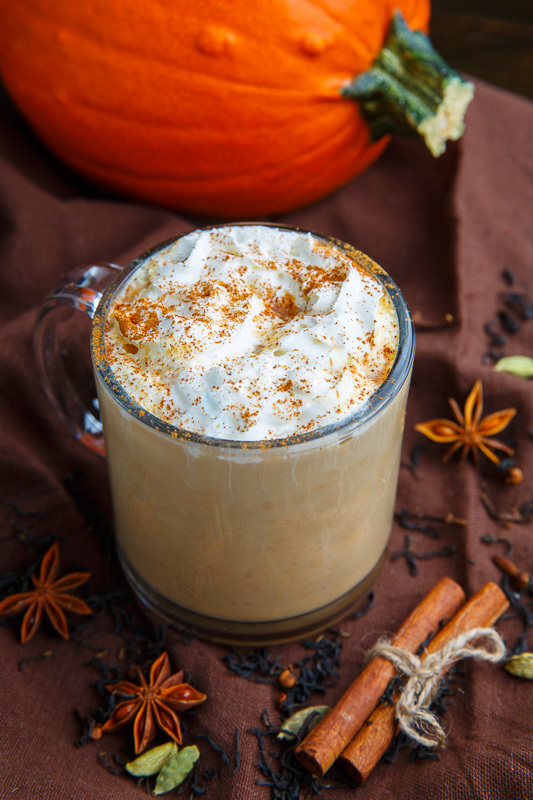 This pumpkin chai latte is the perfect way to relax and unwind or reward yourself after a busy day! Heat everything in a large sauce pan until the milk starts to froth up but before it boils. Note: Steep 4 bags of your favourite chai tea in 1 cup water as directed on the package or brew your own using the recipe below. Option: Use different sweeteners like maple syrup, caramel sauce, dulce de leche, brown sugar, honey, etc. Option: Strain the warmed latte for a smoother finish. Option: Serve topped with whipped cream! A richly aromatic and flavourful chai tea with hints of pumpkin pie spices. Bring everything just to a boil, remove from heat and let it steep for 10 minutes. Note: Only use one cup of water for the strong brewed chai tea in the pumpkin chai latte recipe above! Option: Replace the black tea, with oolong or red rooibos, etc. Option: Add 1/2 teaspoon whole black peppercorns or a pinch of chili flakes/powder for some warmth. Option: Serve with sweetener and milk/cream to taste. Looks perfect for a Fall evening! Such a comforting and warming beverage. I happen to have a fair amount of pumpkin puree left, and this I must try. Sounds delicious. I am living in the US South at the moment, my morning pumpkin treat was a pumpkin scone … not bad . That sounds nice! There have been a lot of pumpkin drinks, but this is definitely special! Bookworm: Great question! It should be Masala Chai or in this case perhaps Pumpkin Masala Chai.